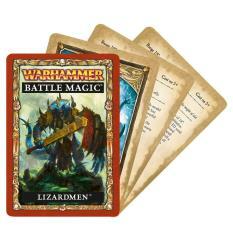 Warhammer Battle Magic: Lizardmen contains 8 spells from the Lore of High Magic as described in Warhammer: Lizardmen. They are printed on individual cards as a handy reference for use in your battles. Each full-colour card describes one spell, and all the information you need to use it on the battlefield, including spell type, casting value and range. As well as the 6 spells from the Lore of High Magic, this set also includes the 2 signature spells for the Lizardmen: Drain Magic, and Soul Quench. Not only are the spell cards a great, tactile way of representing magic in your games but on a practical level they make selecting spells easy and speed up play in the heat of battle.